SPview III has had a major feature upgrade. A multitude of new features makes SPview a powerful analytical tool. SPview is an S-Parameter toolset for RF and Microwave engineering.With built in GPIB, LAN, USB and RS232 capabilities, it can capture data directly from Vector Network Analyzers, Spectrum Analyzers, Scalar Analyzers and Oscilloscopes. It can produce S-parameter files compatible with all major simulators. Built in charting and data manipulation features enable faster circuit design, the2-port functions charts are particularly useful for amplifier designers often removing several measure/simulate cycles. SPview gives older VNA's the facilities available in newer and more expensive models and additionally it can capture N-port data, that is, 3,4..99 port data can be captured using only a 2-port or T/R Analyser and saved as S-parameter files. Spview supports National Instruments NI488, Agilent SICL libraries along with VISA from many vendors. RS USB smart instruments are also supported. No third party drivers/libraries are require to capture data from instruments equipped with a LAN port. SPview can also import and Contour map Load-pull data from both Focus and Maury file formats. The optional toolset SI pack enables a range of Signal Integrity functions and transforms including the Mixed-mode differential and common mode transform and eye diagram plotter. SPview 3 now includes a full multiport linear simulator complete with visual schematic editor. Data files can be drag and dropped onto schematics and connected to other components such as resistors, capacitors, inductors and transmission lines. Ports can be changed to any arbitrary real impedance and the schematic editor also includes a NEG2 element to allow S-parameter data to be de-embedded on a port by port basis. The schematics are accompanied by a comprehensive suite of measurements, all simulation is fully automatic, no need to set up special simulation settings. SPview now comes with a suite of mathemetical features, plot any equation as a function of a swept variable, equations can operate on complex as well as scalar data. Equations produce new traces as a function of variables and/or existing trace data. The new poynomial trend line feature creates and plots equations from existing trace data. Statistical analysis functions combine with special tools to search for and combine data in disk folders. Now historical data from production runs can be combined and min/max, mean and standard deviation can be applied. SPview is fully programmable via the ActiveX scripting system, Visual Basic and Jscript are fully integrated. Users can also program the remote control interface through the comprehensive programming API. For a list of Instruments directly supported by SPview, see Supported Equipment. Any instrument can be controlled via the script system. 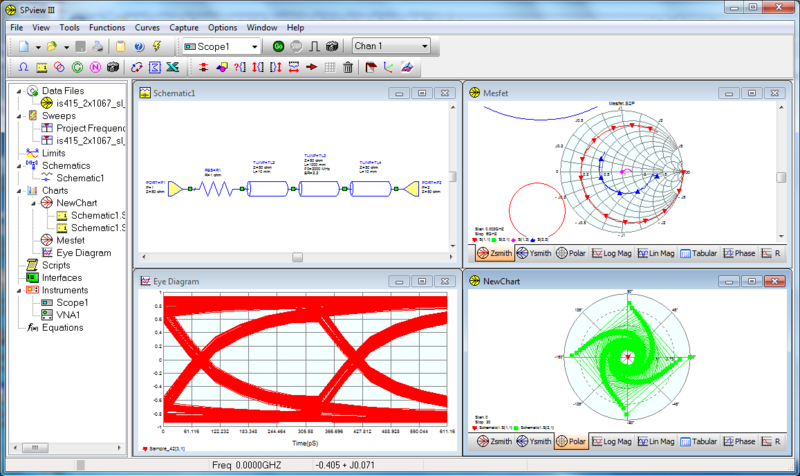 Data capture from Vector, Spectrum, Scalar Analyzers and Oscilloscopes. Real-Time, single shot and screen copy modes. Displays data using several chart types including Zsmith, Ysmith, Polar and Log magnitude. Visual data editing, merging and analysis. Linear simulator with schematic entry, drag & drop data files onto schematics and connect to components. Deembedding using 2 port NEG2 negation element. Import and process Load-Pull data files with contour mapping. Process and plot S-parameter data in mixed mode differential form. Eye diagram plots for signal integrity applications. Plot arbitrary equations as a function of existing data files and/or independant variables. Wide range of statistical analysis functions include min/max mean and standard deviation. MDIF (mdf) file supported, open, plot and use MDIF libraries in schematics. MDIF builder tool for creating MDIF library files from individual Touchstone data. User defined limit lines with greater than, less than or in range goals. Comprehensive S-parameter function analysis chart set. Time domain gating for connector discontinuity removal. Post processing modes including ref-plane adjustments and stability circles. COM connectivity to other COM enabled software and simulators. Built in programmability with VBscript and JAVA script languages. Saves captured data as '.SNP' S-parameter files for input into simulators. Create new files using data from data books with numeric or graphical entry. Real-Time panning and zooming of all chart types using mouse. Versatile marker types- Trace, Data, Delta and verticle markers. Status readout with precise data-point values in both U+JV and R+JX. 2-Port function charts including Stability(K-factor,Det,b1) and Power gain (Gmsg, Gamax, Gu). Export data in .csv format for direct import into MS Excel. Stability circles mode with continuously variable frequency sweep control. Load, save and convert 2-port Y,Z and H parameter files in MA, DB or RI format. Renormalize data to any impedance. Windows metafile clipboard copy for full resolution documentation using word processors. Multi level undo/redo on chart and schematic operations. Edit all trace data onscreen by simply grabbing data points and dragging across the screen. Insert and delete data points onscreen with auto interpolation. Grab and drag whole curves. Get the evaluation software from the downloads page. SPview Ver 3 upgrade is for Version 2 owners. To request a quote complete the form below, payment methods include Cheque, direct bank transfer. Go to the online ordering page to order online using a credit card and receive a 5% discount. Send mail to webmaster@arkrfsystems.com with questions or comments about this web site.